Andromeda Group integrates different companies that comprise the entire aquaculture cycle: reproduction and breeding, fry transport, pre-growing, processing, packaging and commercialization, etc. A unique serial number and a special assigned codification during the packaging process – and reflected in the bar code – offer total traceability, from the raw material to the delivery of the final product. Quality and sanitary controls extended throughout the whole cycle to ensure the fish well-being and a perfect sanitary condition that result in an optimal development and in obtaining a high-quality product, nutritious, healthy and with total sanitary guarantee. Frescamar Alimentación exhaustively analyzes its suppliers demanding strict compliance with hygienic and safety regulations along with other quality requirements and technical specifications, so that the final product fully meets its customers’ expectations. These efforts have meant the achievement of internationally recognized certifications in terms of quality and food safety, such as ISO 9001, ISO 22000, ISO 14001, GLOBAL G.A.P., IFS and BRC. These last two have recently been achieved with very high scores. The company is currently working on the implementation of the IFS and BRC standards, the most valued among food industry. Frescamar’s compromise with society goes much deeper than its products quality and security. The company has committed to sustainable aquaculture from its very beginning. With the aim to minimize the environmental impact of its activity, its farms have implemented sustainable practices from many years ago, by which the company optimizes the use of natural resources and minimizes environmental impact. Frescamar develops an activity not only compatible with the environment but totally integrated in it. An effort that is proven by the implementation of international environmental management standards such as ISO 14001 certification and has also led to the certification “Friend of the Sea”. Andromeda Group – which integrates Frescamar – extremesits day-to-day requirements in this area and it is currently in the process of obtaining new international certifications such as Best Aquaculture Practices and Monterrey Bay Aquarium Certification. On the other hand, it is currently collaborating as a pilot company in the development of the Aquaculture Stewardship Council (ASC) standard for Mediterranean species, which will make Frescamar a pioneer in implementing the most internationally recognized standard in environmental preservation, promoted by WWF. Frescamar’s commitment with sustainability has been implemented with the development of a specific organic fish product line embracing from fries to the final product: “Frescamar Bio”. It is important to mention that Andromeda Group is the only producer in Spain to hold whole cycle Organic Certification. Corvina’s feeding is based only on natural feed, free from meat meal, porcine by-products and free from genetically modified materials (OGM). A superb quality feed made from an exclusive Andromeda Group formulation supported by our long career and experience in this matter. Because of such meticulous and strict feeding, Corvina REX Frescamar holds Halal Food & Quality Certification which guarantees the products quality under Islamic dietetic law requirements and food safety. 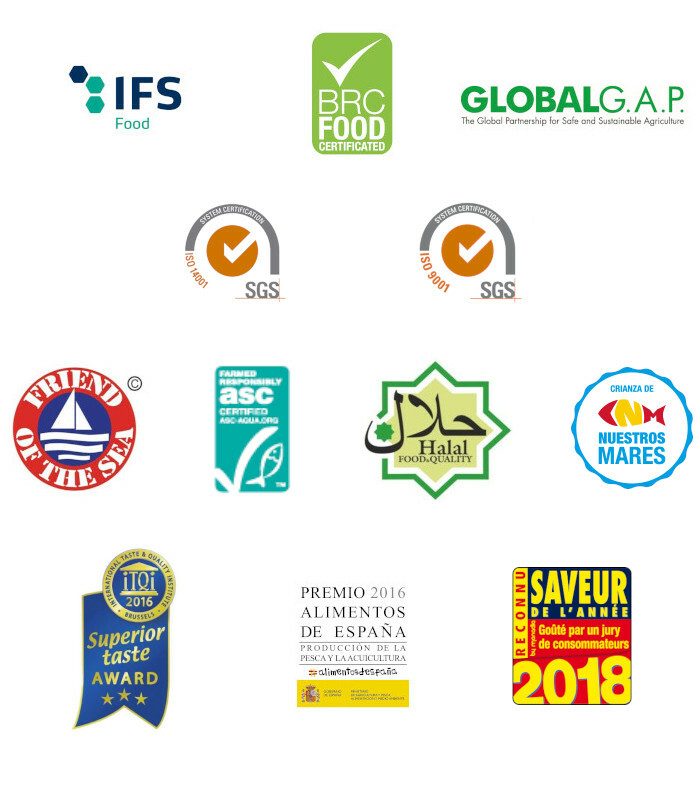 Under this section we gather all certificates, guarantee seals or awards conferred to Andromeda Group, Frescamar Alimentación and their products. NOTE: some of them have already been mentioned under their corresponding division. Andromeda Groupholds GLOBAL G.A.P. certification, the most important international regulation in terms of agricultural fair practice which includes the whole production process, from fingerlings and subsequent activities until the moment in which the product is retrieved form the facilities. Additionally, the Group holds ISO 9001 certification, which guarantee food Quality. Within this field, the company has recently certified its aquaculture fish processing and packaging activities under the International Food Standard (IFS) and the British Retail Consortium (BRC) standards. The most worldwide appreciated quality and food safety certifications. On the other hand, all processes of the group’s companies follow the procedures of ISO 14001. An internationally recognized standard for environmental management that certifies the good use of natural resources and optimal handling and disposal of waste, among others. Its commitment to the preservation of the marine habitat led the Group to obtain the Friend of the Sea international certification in 2015 and it is currently in the process of obtaining new international certifications such as Aquaculture Stewardship Council (ASC), Best Aquaculture Practices and the Monterrey Bay Aquarium Program. The Group cooperates with the development of the Aquaculture Stewardship Council standard for the Mediterranean species, which will lead it to be a pioneer in implementing the most internationally recognized certification in environmental preservation, promoted by the World Wildlife Fund (WWF). Regarding its ecological range, which includes Seabream and Seabass under the brand “Frescamar Bio”, it is noteworthy that Andromeda Group is the only producer in Spain to hold whole cycle Organic Certification. Corvina REX Frescamar, moreover, in the only European Corvina to hold Halal Food & Quality Certification which guarantees that the product fully meets Islamic dietetic law requirements. Continuing Frescamar Alimentación products, its Seabream,Seabass and Corvina have the seal Crianza de Nuestros Mares. A seal that, through a tag placed on the gill, guarantees its Spanish coasts origin. As a result of the Group’s efforts to provide the highest quality, Corvina REX Frescamar has been the only fresh fish product to receive the Superior Taste Award 2016 (granted by the International Taste & Quality Institute). Based on organoleptic parameters such as aroma, texture or flavor, its corvina fillet has obtained the highest rating: three stars that recognize the product as “Exceptional”. Frescamar Alimentación was conferred the Alimentos de España 2016 award(Spanish Food Awards 2016) in the Fishing and Aquaculture Production category. An award granted by the Ministry of Agriculture and Fisheries, Food and Environment which a knowledges the company’s background and rewards its business trajectory, its socioeconomic relevanceand the innovative nature of the corporation as well as its contribution to the promotion and improvement of aquaculture products’ image and their position in the market. Corvina REX has also received the Award Saveur de l’Année 2018. A new recognition to its flavor, aroma and texture thanks to the only food sector quality certification based exclusively on tasting qualities of tested products, tried and approved by consumers themselves. The Group’s Research, Development and Innovation department aims the continuous improvement of fish quality and its organoleptic characteristics. Group Andromeda’s strong commitment to R & D + I guarantee the optimization and development of all processes and allows it to respond to the many challenges that are to come.